Gluten-free food has got to be one of the most significant menu trends in many years. Many people are making voluntary decisions to go gluten-free, but those who have been diagnosed with celiac disease have no choice but to eliminate gluten from their diets. Such has been the case for my sweet mom, who recently learned she has celiac. As she has been working on a major diet makeover, I’ve been trying to help out by researching gluten-free foods and doing some cooking for her. 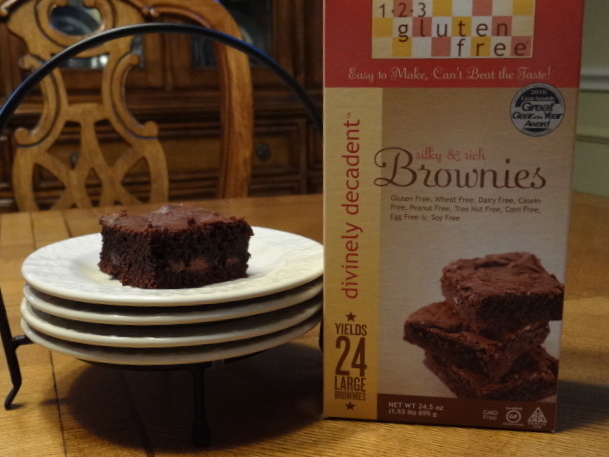 I purchased a box of 1-2-3 Gluten Free Brownies before I knew the story behind the product, but I started doing my research as soon as I got home with the brownie mix. Company founder Kimberlee Ullner learned she had celiac when she was an adult, and she resigned herself to eliminate foods she loved to eat, and eat only the gluten-free foods available on the market. Her resignation turned to resolve when her two nieces and a nephew were diagnosed with celiac. She wanted them to be able to eat the same types of foods their friends enjoyed, and she started developing her own recipes for gluten-free foods. Her nieces and nephew were not the only ones to give her recipes rave reviews; everyone thought they were delicious, and family members encouraged her to develop products for the market. Kimberlee’s story was very compelling and her products appealing. Mom and I had researched gluten-free baking from scratch, and we quickly determined that was going to be a no-go in most cases. In Mom’s home town, all the specialty flours and gluten-free products aren’t readily available. In anyone’s home town, these ingredients can be expensive to buy and a pain to store. Although the products are more accessible in the Dallas area where we live, the “from-scratch” recipes we found were complicated. Mom doesn’t have the energy, and I don’t have the time for complex recipes. When Mom was diagnosed, one of the first gluten-free products I bought was a brownie mix that yielded an 8″x*8″ pan and cost $19.99. Not very practical for many people! I was happy to find the 1-2-3 Gluten Free Brownie Mix for less than one-half of that cost, and was thrilled with the end result. The mix makes a 9″x13″ pan of thick, silky, and completely delicious brownies. They aren’t just good gluten-free brownies; they are really good brownies, period. The company’s tag-line is “Easy to Make, Can’t Beat the Taste!”, and we heartily agree. 1-2-3 Gluten Free Brownies achieved a trifecta in gluten-free baking: affordable, easy, and delicious. Mom and I are anxious to try some of the company’s other baking mixes. “Aaron’s Favorite Rolls” just might be next! Check out Kimberlee’s gluten-free mixes on her website. Mom and I highly recommend the brownies!